Rhyme Boards can be used to develop children's attention and listening skills, language skills, and rhyme recognition skills. They are mainly for use with Foundation Stage and Key Stage 1. They may be used with whole class or small groups of children. What is a Rhyme Board? 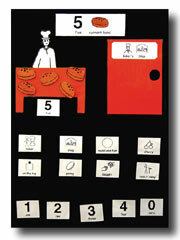 A Rhyme Board is a way of teaching rhymes to a group of children using visual prompts. As the rhyme is said, symbols or objects are used to help the group understand and remember the words. A set of symbols or images that support the key words in the rhyme. A set of illustrative pictures that set the scene or allow animation of the rhyme e.g. small dolls, finger puppets, photos. The Rhyme may be told by the adult to a group, but also pupils can join in by adding items to the board.